Hair is a fact of life, you have it on your head, arms, legs and some people have an excessive amount on their backs. In ancient times hair was an essential part of the human body, it acted as a layer of protection, from the damaging rays of the sun and to help, to keep you warm. But, this is no longer an issue in the modern world. Now, hair is often an unwanted necessity. Women are generally expected to be hair free whilst male bodybuilders, athletes and models will often remove their body hair. You probably already exfoliate on a regular basis. However, you will find that the hair comes out of your skin easier and with less pain if you exfoliate one day before you use the epilator. It is not a good idea to do this straight before you epilate as it will make your skin too tender. The process will help you to pluck your hairs with ease but it will be more painful if you exfoliate too close to when you epilate. The best way to do this is with an exfoliating glove; rub your skin in circles. 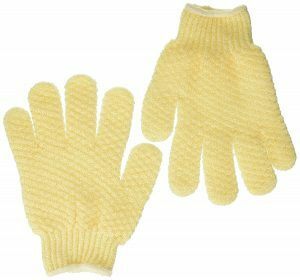 If you want to try exfoliating and you need a decent peeling glove you can use the Earth Therapeutics Exfoliating Hydro Gloves. Once you have exfoliated to remove dead skin cells you need to wash them off your body. A hot bath can assist with this; but it also offers additional benefits to help with perfect hair removal. Hot water will open your pores and allow any dirt or bacteria in them to be washed out. It will also soften your skin; allowing the epilator to glide across and reduce the pain of having your hairs plucked. Bathing in warm or hot water can also leave you feeling very content; being relaxed will help the epilator run smoothly across your skin. If you have taken the time to prepare your skin for the maximum possible hair removal then you will need to continue this process when actually removing the hair! Move your epilator slowly across your skin. If you move it too fast you will miss some of the hairs. More importantly, you will cut many of them at skin level rather than plucking them from your skin. You will know if you have done this as you will feel the stubble on your skin the next day! It is not enough to glide the epilator across your skin slowly one time. No matter how many tweezers there are on the epilator and how many hairs it can theoretically remove every minute; it will miss some. To avoid this issue you need to run the epilator across the same piece of skin several times. This will provide maximum hair removal. It is essential to cleanse your skin once you have finished epilating. This will remove any debris created during the hair removal process. This is essential as debris can clog the pores and create spots. It can also cover any hair follicles and cause in-growing hairs; which are not something you want to be dealing with before your special night! After this process has been completed you need to moisturize your skin. If you have accidentally damaged your skin whilst conducting hair removal the moisturizer will help the skin cells to heal. It can also act as a protection layer for the pores; allowing them to calm naturally and leave your skin positively glowing. You may also wish to consider using a cream which slows hair re-growth; this will extend the amount of time required between hair removal sessions. The actual time between hair removal sessions is dependent upon how fast your hair grows, your hair type and even how well it was removed before. It is advisable to move the epilator against the direction of your hair; this usually means up your leg. This will ensure as many hairs as possible are lifted and plucked. It will also make sure you have a smooth finish! If you have purchased an epilator which can be used in water then try it! A warm bath will trigger a release of endorphins in your body. This will help to reduce any pain experienced when epilating. To get that perfect hair removal finish you need to complete the process 24 hours before you want to show it off. This will give your body enough time to recover from an irritation and ensure it looks its hair free best! Follow these tips and you will have perfect hair removal and be the envy of your friends!